A North Atlantic right whale swimming off Duxbury Beach in 2015. 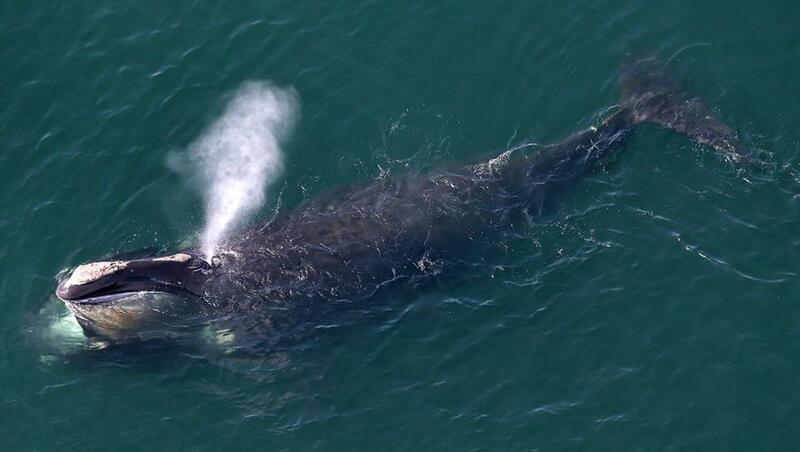 Nearly two dozen North Atlantic right whales have been spotted swimming in the waters south of Nantucket, prompting federal authorities to ask large commercial fishing vessels to slow down in the area. In a statement Friday, NOAA Fisheries said a “voluntary vessel speed restriction zone” had been established 30 nautical miles south of Nantucket “to protect an aggregation of 22 right whales sighted in this area” on Tuesday. “Mariners are requested to route around this area or transit through it at 10 knots or less,” the statement said. The request will remain in effect through Feb. 5. Meanwhile, mandatory speed restrictions are in effect on Cape Cod Bay through May 15, and in waters off Block Island, New York, Philadelphia, and Norfolk, Va., through April 30, according to the statement. The announcement comes after a coalition of environmental groups filed a lawsuit earlier this month in US District Court in Washington, D.C., alleging that federal regulators must do more to protect endangered North Atlantic right whales from getting tangled up in lobster gear. The suit says entanglement in commercial fishing gear has been the “primary cause” of right whale deaths in recent years. There were only about 455 right whales in 2016, and at least 17 died last year, “pushing the species even closer to the brink of extinction,” the 33-page civil complaint states. Many of the whales have been spotted off Cape Cod. Jane P. Davenport, senior attorney at Defenders of Wildlife, one of the groups that brought the lawsuit, said in an e-mail that Friday’s announcement from NOAA isn’t linked to the civil action. Boaters are urged to report all right whale sightings by calling 866-755-NOAA (6622). The Right Whale Listening Network says on its website that taking it slow on the high seas could save a whale’s life.